Jose Mourinho seldom looked so relaxed in defeat: Pep Guardiola had beaten him for the eighth time but Jose was not going to subject himself to the torture of the Old Trafford derby defeat. He came under further scrutiny following a third successive loss, at Watford eight days later, but he had begun to address his errors at Vicarage Road. 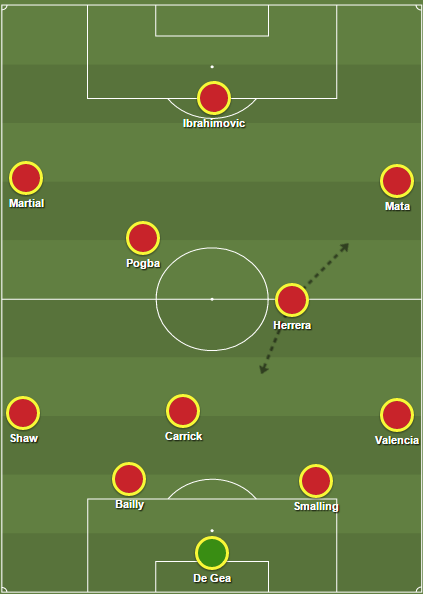 United are now settled in a 4-3-3 formation, rather than that early season 4-2-3-1, Wayne Rooney is a substitute and, in Ander Herrera, Mourinho has a more suitable holding midfielder than the immobile Marouane Fellaini. There remains a risk in starting Herrera as Liverpool, like City, possess a fleet-footed and nimble forward line who move the ball quickly and there's a danger Herrera - like Fellaini in the derby - could be left isolated. Paul Pogba lacked positional discipline and it was ironic that the much-maligned Rooney was the only player pressing City high up the pitch. Pogba was branded 'a kid in the schoolyard' but, although he and Herrera combined superbly in the 4-1 win over Leicester, they face their first ultimate test at Anfield. City's supremacy at Old Trafford last month was aided by the ease with which they zipped the ball through our porous midfield and the 'route one' move for the opening goal began adjacent to City's own corner flag. Pogba and Juan Mata have started in front of Herrera in the last two games, but Mourinho - aware of the trio's defensive shortcomings - must strike a balance of securing midfield without blunting our attack. Mata has found his most influential role at United against opponents who play on the counter attack but Liverpool will not adopt that approach. Against City, Herrera and Marcus Rashford came on at half-time which allowed Pogba and Fellaini to push forward, with Rooney shifted wide. The pressing- non existent in the first half- increased and Herrera's influence forced Guardiola introduce the defensive-minded Fernando. Neither Michael Carrick nor Morgan Schneiderlin have the intensity or energy to match Herrera, and as a partnership last season both embodied the rigid and robotic unadventurous style of Louis van Gaal. Both are fine players individually but an incompatible partnership. Mourinho might be tempted to go with one of them at Anfield, though. Carrick's vision and range of passing could be key if United adopt a counter-attacking game plan but the problem with Schneiderlin is his lack of game time having not started since the West Ham away game last season. By shifting Herrera into an advanced role, he can combine with Valencia and - if selected- Mata to double and triple up on somewhat makeshift left-back James Milner. In such these games there is no fixed formation and our shape will change depending on whether we have the ball or not. Carrick has experience of playing a centre-half so can drop deep to complement the back line, enabling Valencia and either Luke Shaw or Daley Blind to offer width. It will be just one in a series of fascinating tactical set-ups.